On your website on Envaya, you can create a Discussions page, which allows anyone – from your organization or other organizations, from your community or anywhere in the world – to collaborate and discuss topics related to your organization and its work. To create a Discussions page, log in to Envaya and go to the Edit Site page ( ). Scroll down to the Edit Pages section, and click Discussions. 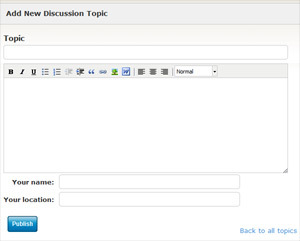 To start your first discussion topic, click Add New Discussion Topic. Under Topic, type the subject of the topic that you want to discuss. Then, type your message in the large box below, and enter your name and location. Finally, click the blue button to publish your new discussion on your website. This will create a Discussions page in the menu of your organization's website, with a link to the discussion you just created. Anyone who visits your organization's discussions page can reply and add a new message to your discussion. It is not necessary to register for an Envaya account in order to add messages to discussions. Click Invite people to participate at the bottom of your discussion to send a link (by email) to other people and organizations you know who might be interested in contributing to the discussion. Then, enter the email addresses you would like to invite. 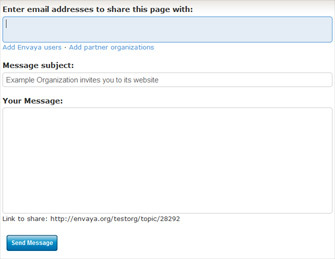 You can also click Add Envaya users or Add partner organizations to automatically add the email addresses for other organizations on Envaya. Write a message telling people about your new discussion, and click the blue button at the bottom of the page to send the invitation.